Macquarie University have created transcriptions of the Journals of Elizabeth and Lachlan Macquarie through the magnificent project entitled Journeys in Time 1809 - 1822. Please click here for transcript of Lachlan Macquarie: A Voyage – and Tour of Inspection – from Port Jackson – to the Settlements of Port Macquarie, and Newcastle: – In November 1821. Alan Cunningham, the Government Botanist, arrived in the Colony of New South Wales in 1817. He served as a member of the exploration parties under Oxley and Captain P.P. King. In a series of explorations between 1823 and 1827 he discovered Pandora's Pass and the Darling Downs, explored the Liverpool Plains and made many other valuable discoveries. From 1837 to 1838 he was Superintendent of the Sydney Botanic Gardens and later died in 1839. 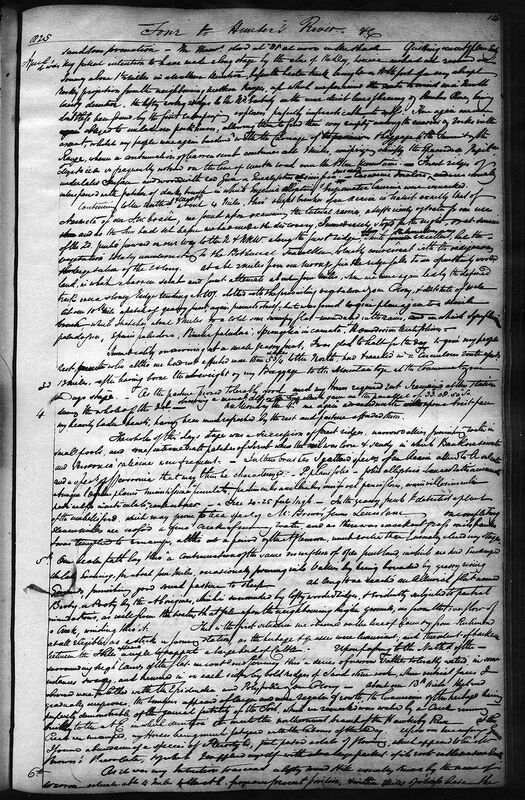 He recorded a journey to Hunter's River from March 29th 1825 to May 31st 1825. The following four page excerpt comes from a library copy of a manuscript [Shelf Location Q994.02 CUNN 2 Vols.] held in the Mitchell Library Sydney [Ref. 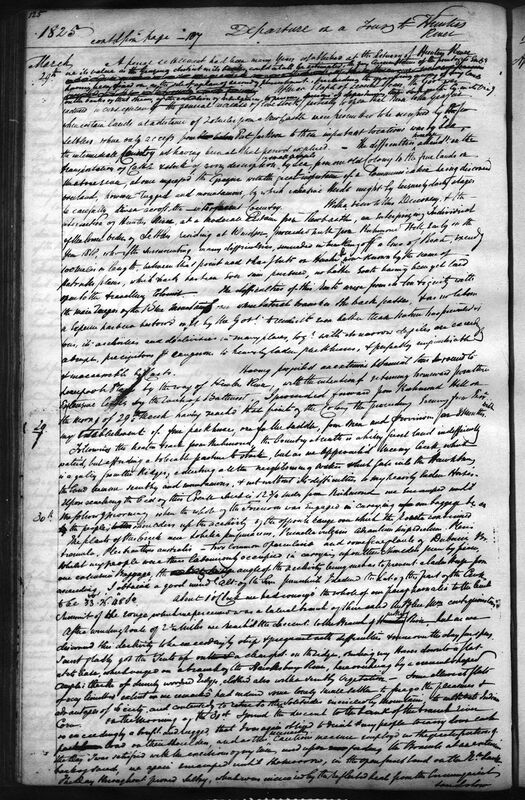 1746-1] entitled Cunningham's Journal September 1822 to February 1831. This account breaks off after April 10th 1825 [folio 128] with the note that it is continued in "Book No.3 to May 31st". Grantham, Ian. (ed) XYZ goes north : "an account of a trip to the Hunter's River", and "a visit to Wollombi and the Cumnaroy" / edited and annotated by Ian Grantham. Kulnura [N.S.W.] : Wirrimbirra Workshop, 1999. Peter Miller Cunningham 1789 - 1864 visited the settlement at Hunter's River and published his account in a work entitled Two Years in New South Wales; A Series of Letters, comprising Sketches of the Actual State of Society in that Colony; of its Peculiar Advantages to Emigrants; of its Topography, Natural History, &c. &c. by P. Cunningham, Surgeon, R.N. London: Henry Colburn, New Burlington Street, 1827. Please read our PDF version of Letter VIII pages 142 - 161, (see below) where he described the Maitland Road as a 'bridle-road' and informed us of the 'cart-road' now in progress. (see also V.2 pp.1-45 Aboriginals). Click here for PDF version of Letter VIII. Cunningham, P. (Peter), 1789-1864 Two years in New South Wales : a series of letters, comprising sketches of the actual state of society in that colony, of its peculiar advantages to emigrants, of its topography, natural history, &c. &c. Adelaide : Libraries Board of South Australia, 1966. Auchmuty - Book 994.02 CUNN 1966V.1and V.2 and AUCH - RB/COLL ELLIS 994.02/275 B and 994.02/276 B.
Crawford, Robert, 1799-1848. Young & free : letters of Robert and Thomas Crawford 1821-1830 / edited by Richard Crawford. Macquarie, A.C.T. : Richard Crawford, c1995. Shelf Location: AUCH - RB/COLL 994.402 CRAW and Auchmuty - Book 994.402 CRAWc.2. The National Library of New Zealand holds what we think is the best-ever early map of the Town of Newcastle. The map (MapColl 817.95gbbe/1830/Acc.3580) was drawn by Surveyor John Armstrong, an employee of the Australian Agricultural Company, around 1830, and shows every building and every small detail in the early Town of Newcastle. The National Library of New Zealand has kindly forwarded to us two high-resolution (transparencies). The transparencies were scanned and published here in detail. Henderson, John. Observations on the colonies of New South Wales and Van Diemen's Land. Adelaide, S. Aust. : Libraries Board of South Australia, 1965 Edition Facsimile ed [see pp.143-153] AUCH - RB/COLL ELLIS 994.02/84 B and Auchmuty - Book 994.02 HEND 1965. The New South Wales calendar and general post office directory, 1832. Compiled by James Raymond. Sydney, Public Library of New South Wales, 1966. Location: Auchmuty - Book 919.44 NEWS 183 2and Open Stack - RED 994.4/N1 and AUCH - RB/REF 919.44 NEWS 1832 c.2. Blomfield, T. V. (Thomas Valentine) Memoirs of the Blomfield family / being letters written by the Late Captain T. V. Blomfield and his wife to relatives in England. Mason, Joseph, 1799-1863. Joseph Mason : assigned convict, 1831-1837 / edited by David Kent & Norma Townsend. Carlton, Vic. : Melbourne University Press, 1996. Auchmuty - Book994.02092 MASO-1 KENT. 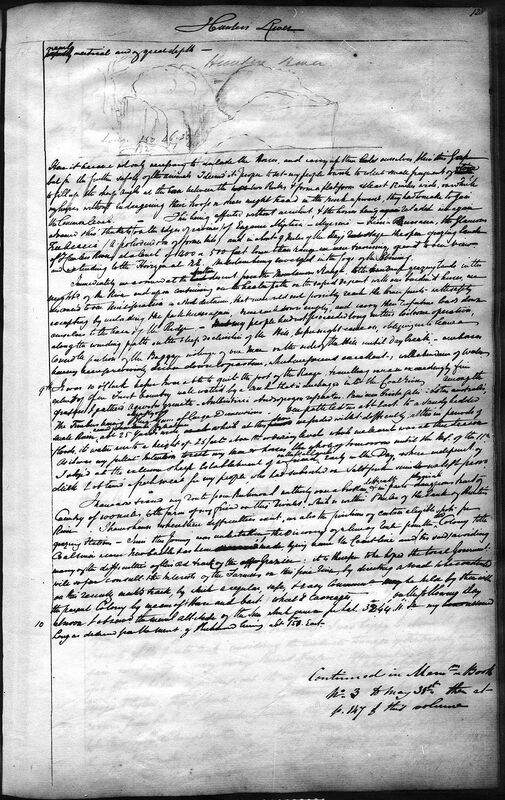 "Nor are these occurences without their parellel in other parts of the country nay a more calamitious event than either of the above took place in the Hunter's River District where two children had strayed into the bush for the purpose it was supposed of hunting bandacoots and being so intent on their amusement did not perceive their danger and so became surrounded by the fire and fell victims to its rage. They were found some time afte lying both together dreadfully burnt and quite dead You could pity the poor little animals and insects in advance of the fire trying to make their escape: a man told me he once saw 3 opossums run out of a hollow tree that had taken fire and ascend to the topmost branches where they sat trembling and an eagle hawk perceiving them dashed down and took away 2  of them in his talons he knew not what became of the other two." Lang, John Dunmore, 1799-1878. An historical and statistical account of New South Wales, both as a penal settlement and as a British colony. London : Cochrane and M'Crone, 1834. 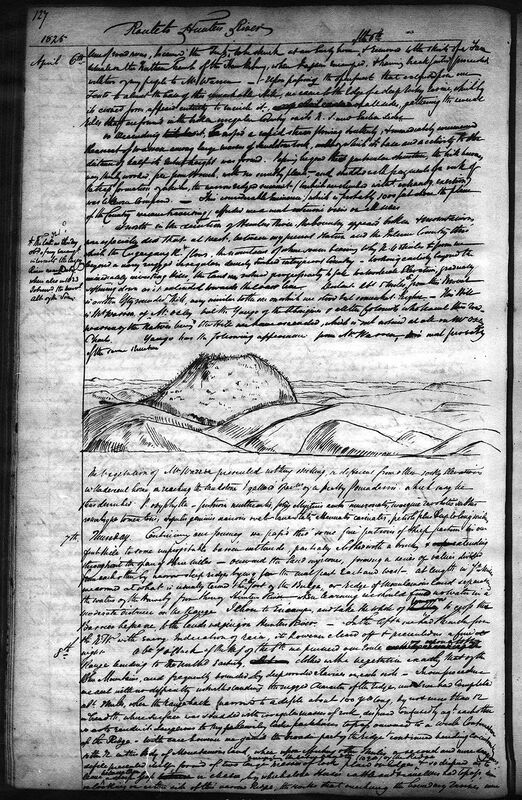 AUCH - RB/COLL 994.4/14 D and AUCH - RB/COLL 994.4/15 D. Click here for Lang's account of the Hunter Region from Vol.2 Chapter 2 pp. 85-126. The New South Wales calendar and General Post Office directory, 1835. Sydney : Printed and published by Stephens & Stokes …, . AUCH - RB/REF 919.44 NEWS 1835. The New South Wales calendar and General Post Office directory, 1836. Sydney : Printed at the Gazette Office for the proprietor,[1836?] AUCH - RB/REF 919.44 NEWS 1836. New South Wales calendar and General Post Office directory for 1837. Sydney : W. Moffitt, 1837. AUCH - RB/REF 919.44 NEWS 1837. Lang, John Dunmore, 1799-1878. An historical and statistical account of New South Wales : both as a penal settlement and as a British colony. 2nd ed. with numerous additions, bringing down the history of the colony to the close of 1836. London : A.J. Valpy, 1837. AUCH - RB/COLL AUROUS 994.4/15 C and AUCH - RB/COLL AUROUS 994.4/14 C.
Davidson, G.F. Travel and Trade in the Far East; or Recollections of Twenty-One Years passed in Java, Singapore, Australia, and China. 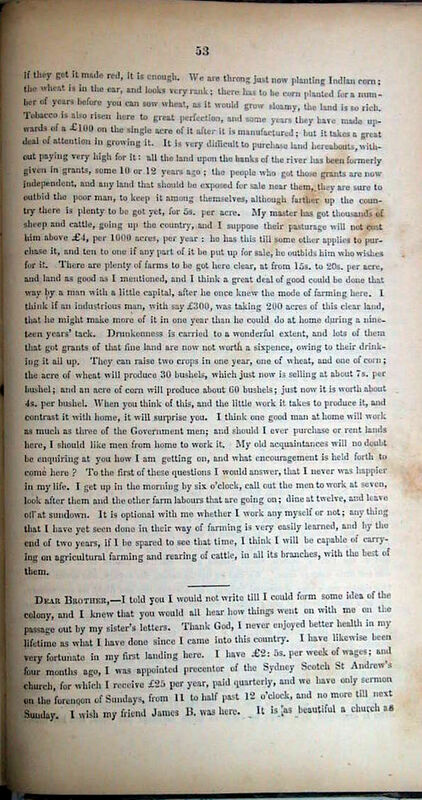 [London, 1846] pp.130-137 letter relating to farming on the Paterson. Reprinted in F. K. Crowley's Colonial Australia, 1788-1840 [West Melbourne, Vic. : Nelson, 1980] pp.531- 532. Letter from a settler on the banks of the Hunter River. This letter is printed at the end of the work entitled Life and times of Oliver Cromwell : prize essay of the Glasgow University Peel Club by Andrew Murray [Glasgow, Scotland : David Bryce, 1838] Rare Book 994 FRIE. Maclehose, James. The picture of Sydney and stranger's guide in New South Wales for 1838 : embellished with forty-three engravings of the public buildings and picturesque land and water views in and near Sydney. 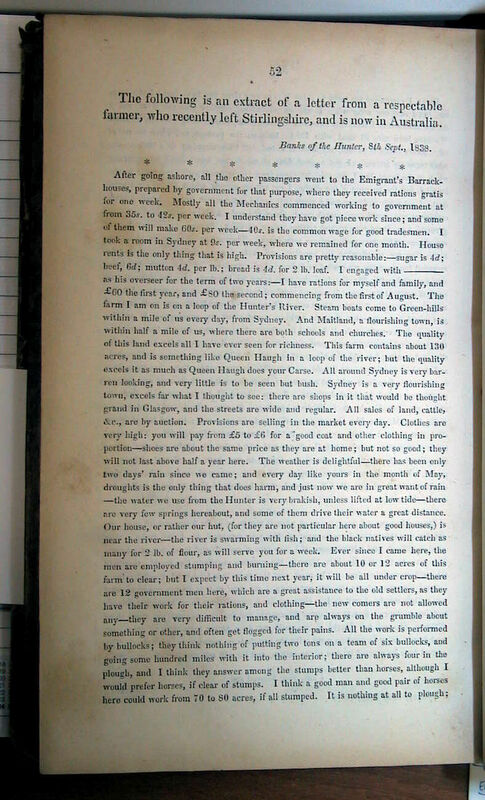 Sydney : J. Maclehose, 1838 (Sydney : Printed by J. Spilsbury) AUCH - RB/COLL AUROUS 919.44/39. Russell, Henry Stuart. 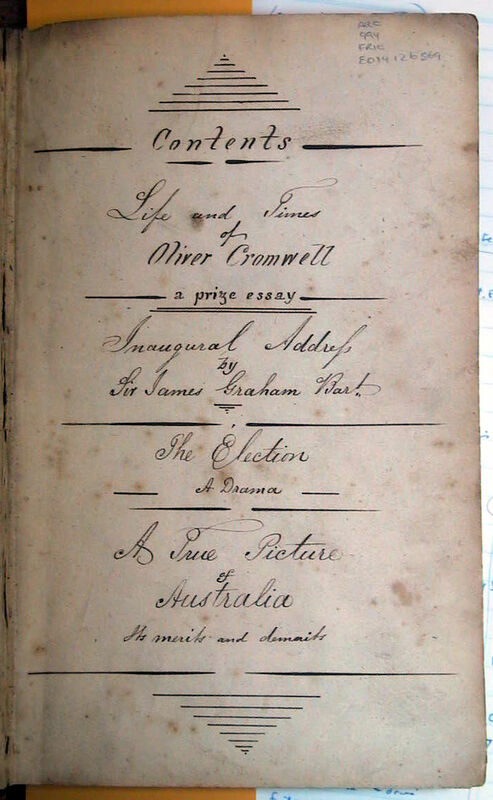 The genesis of Queensland : an account of the first exploring journeys to and over Darling Downs : the earliest days of their occupation; social life; station seeking; the course of discovery, northward and westward; and a résumé of the causes which led to separation from New South Wales : with portrait and fac-similes of maps, log, &c., &c. Sydney : Turner & Henderson, 1888. AUCH - RB/COLL 994.3 RUSS.